The hydrologic cycle. 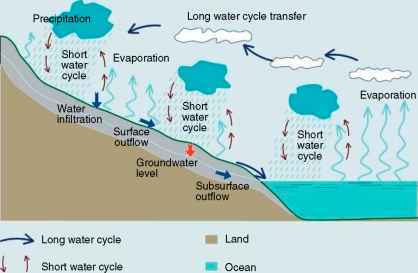 The water (hydrologic) cycle (Figure 3) depicts transport of water and its conversion in different statuses as it circulates throuth both local and global systems. Water exists in three basic states of aggregation: liquid, solid, and gas. Conversion from one state to another is associated with either release or consumption of energy. The water cycle is composed of many components inter connected in a web of complex interactions. Water vapor is able to move fast both horizontally and vertically in a huge amount. Water has high thermal capacity and is able to absorb or reflect solar radiation depending on its wave length. The conversion of water into the three phases enables highly dynamic processes of consumption and release of energy. Thus, water equalizes temperature dif ferences in time (between days and nights) and space (between different places). Water cycle interconnects var ious water sources and reservoirs. Distribution of water on the Earth is shown in Table 1. Humans manage the water cycle basically only within the continents. Water on the continents represents only a minor part of the total water volume on the Earth; however, it has a very rapid turnover and fundamentally influences the climate. 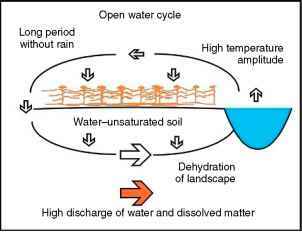 Figure 3 The hydrologic cycle. Adapted from Kravcik M, Pokorny J, Kohutiar J, Kovac M, andToth E (2007) Water for the Recovery of the Climate - A New Water Paradigm. Kosice, Slovakia: People and Water NGO (ISBN: 978-80-969766-5-2). http:// www.waterparadigm.sk/indexen.php7web ./home/homeen.html (accessed December 2007). precipitation following the surface morphology, surface cover, oceanic/inland position, etc. The amount of pre cipitation may range from several tens to several thousands of millimeter per year. Areas with precipitation lower than 250 mm are considered deserts; some tropical areas on the other hand receive more than 2000 mm per year. Evaporation. Evaporation is a process through which water moves to the atmosphere in the form of vapor. For conver sion of 11 of water liquid into water vapor, 2.5 MJ (0.7 kWh at 20 °C) energy is needed. Vegetation largely influences evaporation of water from the Earth's surface. Release of water vapor by plants is called transpiration. Release of water vapor from plant stands, that is, both plant tran spiration and evaporation is called evapotranspiration (ET). ET is a dynamic process depending on the type and state of vegetation, amount of solar radiation, water supply, relative water humidity of the air, etc. Infiltration. Infiltration is the entry of water into the soil. Infiltration is greater in porous materials such as sands or gravels than in clay soils or solid rock. 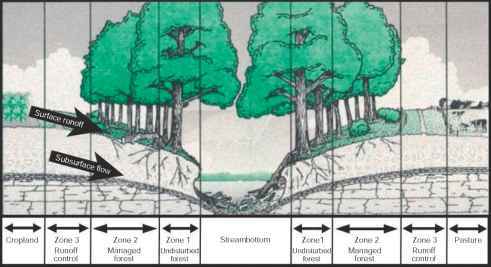 Soil covered with vegetation with well developed root zone has greater infiltration capacity than compacted soil surface. Percolation and groundwater recharge. Deep percolation is a process of water moving downward through the soil below the plant root zone toward the underlying geologic forma tion. The percolated water contributes to replenishing the groundwater supply (groundwater recharge). Runoff. Runoff is moving of the precipitation, snowmelt, or irrigation water over and through the soils to the surface water systems. Overland flow (surface runoff), interflow, and groundwater flows contribute to the runoff. Interflow. Percolating water reaching a restrictive (impermeable) layer like claypan or solid bedrock is forced to move laterally along this layer to a surface water body such as a stream or lake. Groundwater flow. Groundwater flow includes all the water moving through geologic formations. Seasonal recharge behavior, movement through aquifers, and the discharge of water into streams, lakes, and oceans is studied in hydrology. More than 50% of the population depends upon groundwater as its primary source of drinking water. Depression storage. Precipitation that has reached the ground surface in larger amounts may be temporarily stored in surface depressions. This water may succes sively evaporate or inflitrate. Interception. Interception is the retention of precipitated water by the vegetation and other forms of land cover. The water is temporarily stored on the leaves and other surfaces until it evaporates back to the atmosphere. Long (open) water cycle. Water circulation between oceans and continents is called long (open) water cycle (Figure 4). About 86% of total evaporated water evaporates from the seas and oceans and about 14% from the continents. From the total sum of atmospheric precipitation, 74% falls to seas and oceans and 26% to the continents. Thus, seas and oceans provide continents with a given amount of water. A part of the precipitated water infiltrates into ground water flow. A part is used by plants and evaporates through transpiration, while another part evaporates directly. The rest flows with the streams back to the seas and oceans. Under steady state conditions, the amount of water discharged from continents into the seas and oceans is equal to the amount of water/pro vided by oceans in the form of precipitation. Even relatively small excesses from the steady state may result in serious hydrological problems. When the water dis charge from continents is higher than water supply from precipitation, continents lose water and desertification takes place. Such dehydration of landscape occurs due to deforestation, drainage of agriculture land, urbanization, etc., as water flows with the streams directly to the seas. At the same time, water content in the soil decreases, underground water level drops, thus less water evapo rates, leading to decrease in plant production and amount of living plant biomass. Figure 4 Long and short cycling of water. Adapted from Ripl W, Pokorny J, Eiseltova M, and Ridgill S (1994) A holistic approach to the structure and function of wetlands, and their degradation. In: Eiseltova M (ed.) IWRB Publication 32: Restoration of Lake Ecosystems - A Holistic Approach, pp. 16-35. Slimbridge, UK: International Waterfowl & Wetlands Research Bureau. conserves its water very effectively. Local precipitation as well as water runoff from melting snow is low on emis sions with neutral pH value of 6-7. The water outflowing from the forest has near distilled water properties (con ductivity of 2-8 p.S cm 1 at 20 ° C). The recorded climate data are very stable during the day and at night, with optimal temperature control. Water as well as the nutri ents are cycling maximally effectively within the ecosystem. Water as a greenhouse gas. As water absorbs infrared light, it is the most common greenhouse gas in the atmo sphere. Its content in atmosphere ranges from 1 to 4%, whereas content of CO2 is 0.038 3%. Unlike other green house gases, water vapor is heterogenously distributed in the air profile according to air pressure and temperature gradients, dynamically converting from one phase to the other. The influence of water vapor on global climate change is very complex because clouds have antagonistic effect to water vapor and the whole system is highly dynamic. Water in the air has both warming and cooling impacts on the Earth's surface and the performance of the system is hard to predict. The amount and movement of water vapor in the air depends to a large extent also on the landscape management.